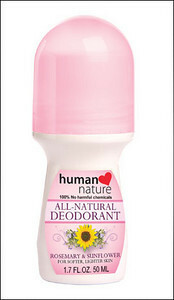 Human Heart Nature has produced an all-natural deodorant that also aims to soften and lighten skin! FINALLY! The long wait is over! For the first time ever, an ALL NATURAL deodorant that’s sure to combat body odor and keep your underarms light with its non-darkening formula. Human Nature has come up with a natural alternative to keep you fresh and clean all day with the latest addition to our product line up. Not everyone may know this, but sweat is generally odourless. It is only when bacteria on the skin start to break down the sweat and mix with it that it starts to produce an offensive body odor. Because one’s underarms are moist and warm, it then becomes the perfect breeding ground for bacteria. To combat this, Human Nature dove deep down (to the seas) in order to find a natural anti-bacterial alternative to the common chemical ingredient alcohol, found in all commercial deodorants, and discovered the wonders of Chitosan. Alcohol in traditional deodorants can cause underarms to darken. Chitosan has no such side-effects! It is 100% naturally derived from the shells of sea crustaceans. It is an anti-bacterial active that is biocompatible, non-toxic and biodegradable. Chitosan has been clinically proven to promote wound healing while also being anti-itching, anti-microbial and an excellent skin moisturizer. And because Human Nature is all about everything natural, we do not recommend using any anti-perspirant actives such as aluminum salts, which has been linked to breast cancer, because it is un-natural to block pores and prevent one’s underarms from sweating. Aside from breast cancer, aluminium salts have also been linked to reproductive system toxicity and neurotoxicity. Now available at Metro Manila branches! Order now!